For the Bloggers Challenge Week 3 we were to use any layout/stamps/ink/card stock and create a Christmas Themed Card - using NON TRADITIONAL Christmas colors . Here's the card I created using Big on Christmas and the Bold Snowflake wheel. As with yesterdays card I used the Scor-It Grid technique from the August TJNL. Card details: The snowflakes were stamped in Elegant Eggplant, Lavender Lace ink was added DTP. 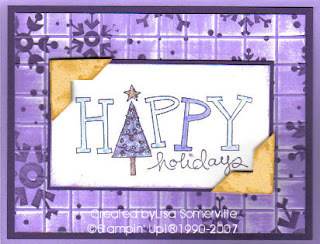 The Big on Christmas image was stamped with Elegant Eggplant, colored with Almost Amethyst and Lavender Lace, So Saffron and Creamy Carmel markers. I used the new Photo Square Punch for the corners, adding So Saffron DTP. The tree is covered in clear stickles. Be sure to check out the Bloggers Challenge links on the side bar - a few new bloggers joined the challenge group. Oh my, I LOVE it and you know why!!! !Great job! Very cute,Lisa! I am lovin' those photo corners...might have to break down and get the punch! Love how you used the photo corners on yours. I was having a hard time figuring out where mine would look decent at. Very pretty Lisa! The photo corners really set it off! This is great. I love the background and the stamp set. Perfect Purple perfection! Great card. gorgeous! love the purples for Christmas, and the So Saffron photo corners really give it some "pop"! I know I already emailed you but wanted to post anyway! Super card!!!!!! I love purple! OK...I've had my eye on this set and you've just pushed me over. Love the non-traditional colors! Stinkin' cute. Love the colors and the technique. That's the one Christmas set I do want to order from the new catty but I'm making myself wait until the Holiday mini is in my hands at convention before I buy anything Christmas!! !